If we count the population employed, India is largely an agrarian country. Nearly 50 percent of Indian population depends on agriculture and allied activities for livelihood. But if contribution to GDP is taken as the parameter, India is predominantly a service economy, and service sector has near 60 percent share of total GDP. Whatever way we see India, there is no doubt that India lacks behind in one sector : The Manufacturing Sector. Yes, this structural problem of Indian economy is highlighted by many economists for many years, and all previous governments had taken some steps to boost manufacturing. The Make in India Initiative by the present government is a big step in this direction, towards making India, an investment hub for manufacturing. Make In India is a new national program designed to transform India into a global manufacturing hub. It contains lot of proposals designed to urge companies — local and foreign — to invest in India and make the country a manufacturing powerhouse. 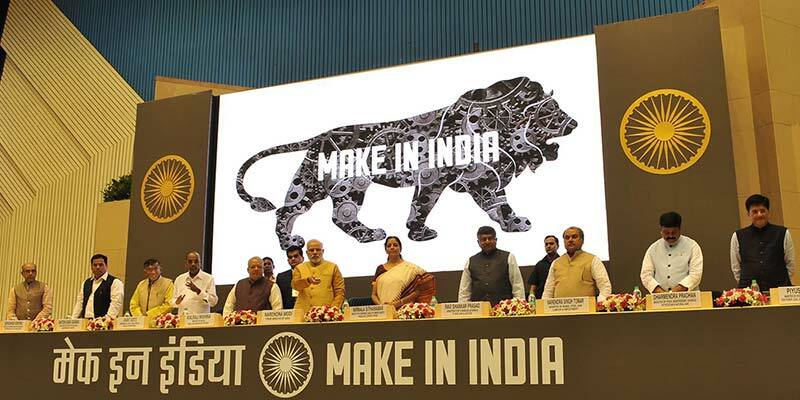 Make In India Initiative : What’s new? Website for business queries : www.makeinindia.com. Social media pages to explain the idea : Eg: MakeinIndia Facebook page. Invest India Cell : Foreign investor facilitation cell. eBiz : single window online clearance portal. Single labour law for small scale industries. Online filing of all returns in a unified form. Why ‘Make in India Initiative’? It is important for the purchasing power of the common man to increase, as this would further boost demand, and hence spur development, in addition to benefiting investors. The faster people are pulled out of poverty and brought into the middle class, the more opportunity will there be for global business. Therefore, investors from abroad need to create jobs. Cost effective manufacturing and a handsome buyer – one who has purchasing power – are both required. More employment means more purchasing power. If each one of our millions of youngsters resolves to manufacture at least one such item, India can become a net exporter of goods. I, therefore, urge upon the youth, in particular our small entrepreneurs that they would never compromise, at least on two counts. First, zero defect and, second again zero effect. We should manufacture goods in such a way that they carry zero defect, that our exported goods are never returned to us. We should manufacture goods with zero effect that they should not have a negative impact on the environment. Many previous governments had taken different steps to attract foreign investment (FDI) to boost manufacturing. ‘Make in India initiative’ talks about nothing different, but this initiative involves better branding and marketing to gain investor confidence. The need to give stress to manufacturing and industries is made clear. An entrepreneurial culture is encouraged, with relaxation in policies. Make in India is surely a visionary move considering the low performance of our industries in last 3-4 years. How to use Make In India Portal for UPSC Exam preparation? Yes, UPSC aspirants and general public interested to know the details of Indian economy (particularly manufacturing sector) got a really good website to do research upon. We are adding www.makeinindia.com to the list of useful government websites for IAS preparation realizing the value of its content. Aspirants are advised to take the best out of this portal, particularly focusing on the links given below. Make In India Initiative Policies. Make in India Initiative Sectors. Very helpful…i belong to obc category, 30 years old in 2015. Will i applicable for upsc 2016. I have obc certificate issued in 2008. Kindly clarify this question.